FOR the first time auctioneer Morgan O’Driscoll will hold New York viewings on April 2 and 3 for his Irish and International Art sale at the RDS on April 29. The venue is O’Sullivan’s Antiques at 51 East 10th St. 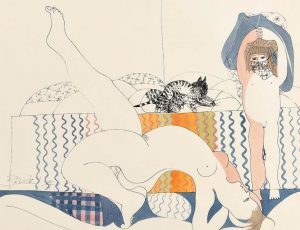 There will be viewings in London on April 15, 16 and 17 and the sale will be on view in Skibbereen from April 20-22 before the Dublin viewings which begin on April 26. There are 161 lots in the auction. 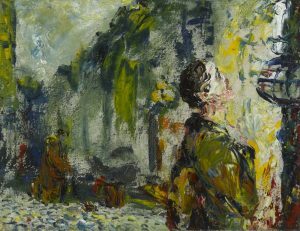 Tralee shows Jack B. Yeats in the last and most romantic phase of his early style. 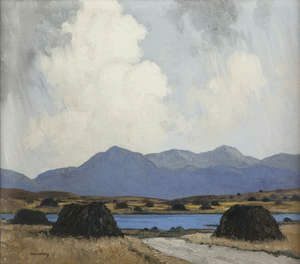 The 1924 work comes up at de Veres evening sale of Irish art at the Royal College of Physicians on Kildare St., Dublin at 6 pm on March 26 with an estimate of 150,000-200,000. Against a background of post sunset fading light it shows an old man gazing reflectively at the water with young people passing by. It can be read as a comment on the past and the future. Emigration had been halted since 1914 by the First World War and the war in Ireland which followed. In 1924 cheap fares to America saw a flood of young people leaving the country. The painting was previously owned both by Sean Lemass and Charles Haughey. Romeo and Juliet (The Last Act) by Jack Butler Yeats. 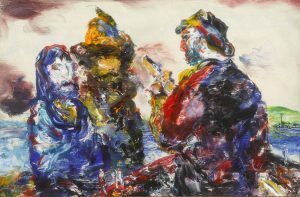 Romeo and Juliet (The Last Act), by Jack Butler Yeats is to be a highlight of Bonhams Modern British and Irish art sale in London on June 12. 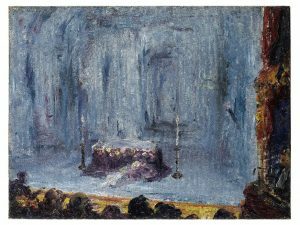 Painted in 1927, the much-exhibited work depicts the ending to the play in the Capulet family mausoleum. Waking from a drugged coma, Juliet finds the lifeless body of Romeo, who had committed suicide believing his wife to be dead. Stricken with grief, Juliet takes her own life. Yeats shows the bodies of the star-crossed lovers slumped at the foot of the tomb. It is not known whether the artist imagined the scene, or based it on a production of the play that he had attended. 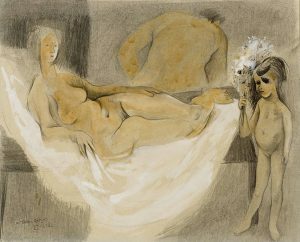 Bonhams Director of Modern British and Irish Art Penny Day said, “With Valentine’s Day fast approaching there could not be a better time to announce the sale of Jack Yeat’s magical depiction of the world’s two most famous fictional lovers. The painting wonderfully captures the atmosphere in the theatre as the play reaches its tragic conclusion.” It is estimated at €90,000-135,000. 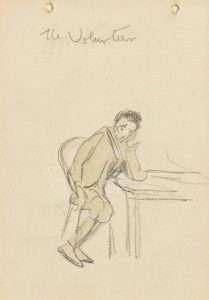 The sale also includes Romeo and Juliet (After Adelaide Claxton) by Walter Sickert estimated at €17,000-23,000. 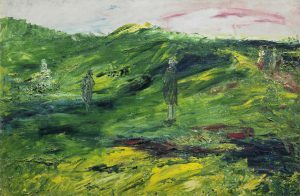 The paintings amassed by Brian P. Burns, billed as one of the greatest collections of Irish art in private hands, will come up at Sotheby’s in London on November 21. It spans artists from the 18th century to the present day reaching over 200 works at its peak. 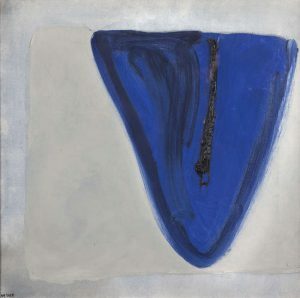 More than forty years ago, Brian P. Burns made a bet with himself: “Isn’t it possible that the Irish could be just as brilliant in the visual arts as they have been in music and literature?” His collection is a personal response to the challenge he set and he has been generous with loans of his art to exhibitions in America and Ireland. 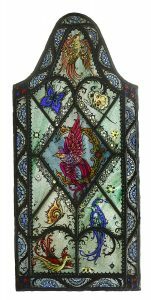 Sotheby’s will offer 100 works form the collection with estimates ranging from £1,000 to £300,000. 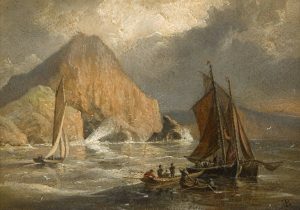 Brian P. Burns, whose grandfather emigrated to Boston from Sneem in 1892, remarked: “Some have asked why Eileen and I have chosen this time to return a large group of paintings from our Irish art collection to the market. 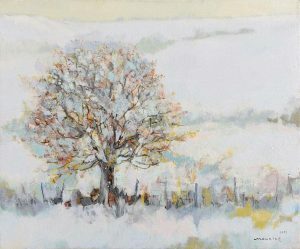 Many years ago, when I started collecting, I was advised by Desmond Fitzgerald, the 29th Knight of Glin; Desmond Guinness, and other art advisors in Ireland to remember that no matter how many paintings I might acquire, I was only a custodian of them during my lifetime. Now at 80-plus years old, and with a collection of more than 200 works, it seemed an appropriate time. We have ensured that a number of paintings will be displayed in Chicago, New York and Boston before they “go across the pond” to be exhibited in Dublin and London before their sale this November. There are works by Yeats, Roderic O’Conor, Sir John Lavery, Sir William Orpen, Walter Osborne, William Leech, Nathaniel Hone, James Brenan, Rowan Gillespie and many other Irish artists and sculptors. 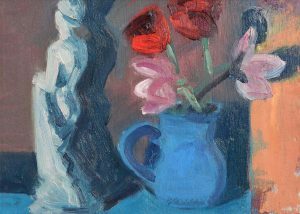 Highlights will be exhibited at the RHA in Dublin from August 30 to September 1. UPDATE: THE ENTIRE COLLECTION BROUGHT IN £3.3 MILLION. 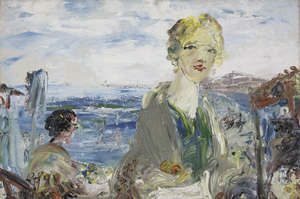 Sunday Evening in September, 1949 by Jack B. Yeats will highlight Sotheby’s Irish art sale in London on September 11. Estimated at £300,000-500,000 it features a young couple taking a stroll on St. Stephen’s Green and is described by Sotheby’s as an evocative ode to the city, of carefree evenings and a timeless tour de force. 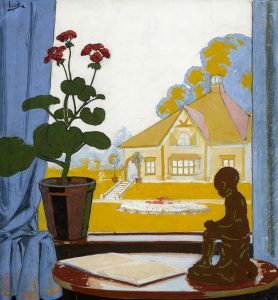 The sale will be led by a single-owner selection of works from the Joseph and Brenda Calihan Collection. 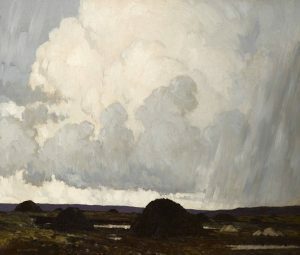 In 16 oils, the Calihan Collection represents a distillation of Irish art across a hundred-year period, from the mid-19th to the mid-20th centuries. The group is characterised by the exemplary and individual qualities of each piece. 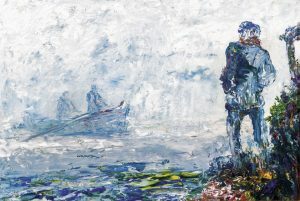 The collection of the Pittsburgh based couple includes works by Jack B Yeats, Paul Henry, Gerard Dillon and John Luke, and carries a combined estimate in the region of €1.6 million. 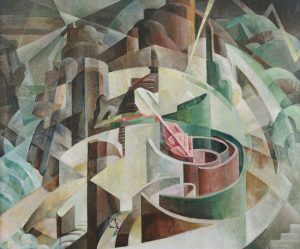 The works will be on view at the RHA on August 30 and September 1. 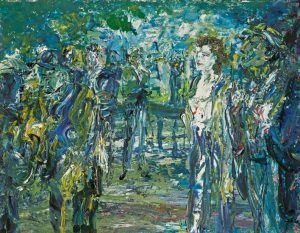 Works by Jack B Yeats, Paul Henry, William Conor, Dan O’Neill, Louis le Brocquy and other leading artists feature at Whyte’s evening sale of Important Irish Art at the RDS in Dublin on May 28. The lead lot is Morning Glory by Yeats, a 14′”x 18″ oil estimated at 80,000-100,000. The catalogue is online. Here is a small selection. 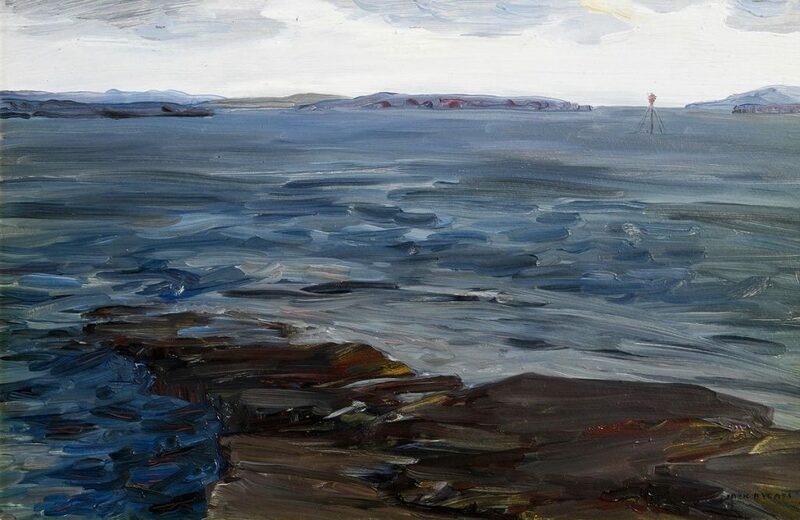 Donnelly’s Hollow by Jack B. Yeats will lead Bonhams Modern British and Irish art sale in London on June 13. The painting depicts the natural amphitheatre at the Curragh in County Kildare where, in 1815, the Irish boxer Dan Donnelly defeated the English champion, George Cooper. The victory assumed lasting political significance in Ireland as a symbol of resistance to the British occupation, and a commemorative monument was erected at the site. Donnelly was famous for the extent of his reach – he had unusually long arms – and for the ferocity of his punch which was delivered with bare knuckles (boxing gloves only became compulsory in 1867). He was, however, as wild out of the ring as in it. 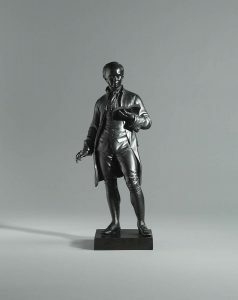 His prodigal lifestyle finally caught up with him, and he died penniless in 1820 at the age of 32. For many years, his right arm was displayed in a pub in Kilcullen. 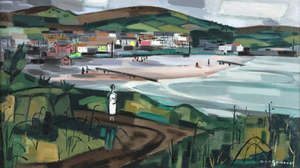 Boxing was a passion for the sports-mad Yeats, and Donnelly’s Hollow is one in a series of paintings that revisit in maturity the obsessions of the artist’s youth. 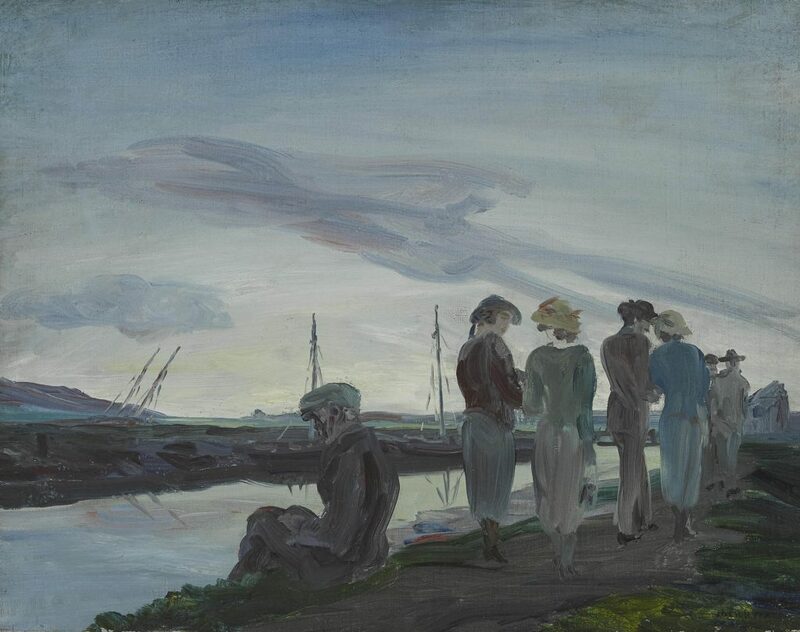 The scene shows a group of visitors paying homage at the monument, and features Yeats himself standing on the hill looking down on it, meditatively. It is estimated at £300,000-500,000 (€340,000-570,000). 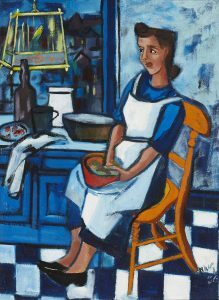 There is an unusually strong representation of Irish women artists at the James Adam sale of Important Irish Art in Dublin on November 22 at 6 pm. The catalogue features artists May Guinness, Eva Hamilton, Letitia Hamilton, Evie Hone, Mary Swanzy, Norah McGuinness, Kitty Wilmer O’Brien, Margaret Stokes, Barbara Warren, Stella Steyn, Sarah Purser, Estella Solomons, Mildred Anne Butler, Rita Duffy, Sandra Bell, Melanie le Brocquy, Nancy Wynne Jones, Anne Madden and several others.